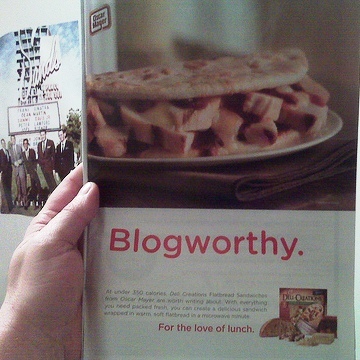 I suppose some people would see this ad for Oscar Mayer luncheon meat and think that blogging has officially jumped the shark. Yeah – on further reflection, this is more a sign that the creative team behind the ad has jumped the shark. Could be. But as a recovering copywriter I can see the signs of deadline desperation in that ad. I’m thinking the client was walking down the hallway toward the writer’s office when this “idea” popped into existence. Dave. You blogged about it. You know, I gotta tell you, I really enjoy this webpage and the great insight. I find it to be refreshing and very informative. I wish there were more blogs like it. Anyhow, I finally decided to write a comment on Blogworthy Meat | Greater Falls! – I just wanna say that you did a good job on this. Cheers dude!